Most plants absorb sunlight and CO2 with their leaves, take up water and minerals from the soil through roots, and are fully autotrophic. However, parasitic plants are a special class of plants that extract water and nutrients from other plants. The origin and evolution of plant parasitism as well as the specific physiology and ecology of parasitic plants are very interesting topics and much remains to be studied. Dodders (Cuscuta spp., Convolvulaceae) are globally distributed holoparasites (i.e., they conduct no or very little photosynthesis), and they are root- and leafless. In recent years, dodders have become an important model for studying parasitic plants (Figure). To gain insight into the evolution of dodders, and provide important resources for studying the physiology and ecology of parasitic plants, the laboratory of Dr. WU Jianqiang from the Kunming Institute of Botany, Chinese Academy of Sciences, combined PacBio sequencing and Illumina transcriptome sequencing technology to obtain a high-quality genome of the dodder Cuscuta australis. WU's lab further performed comparative genomic and molecular evolutionary analyses on the C. australis genome. The researchers detected an intriguing pattern of genome evolution in this parasite. 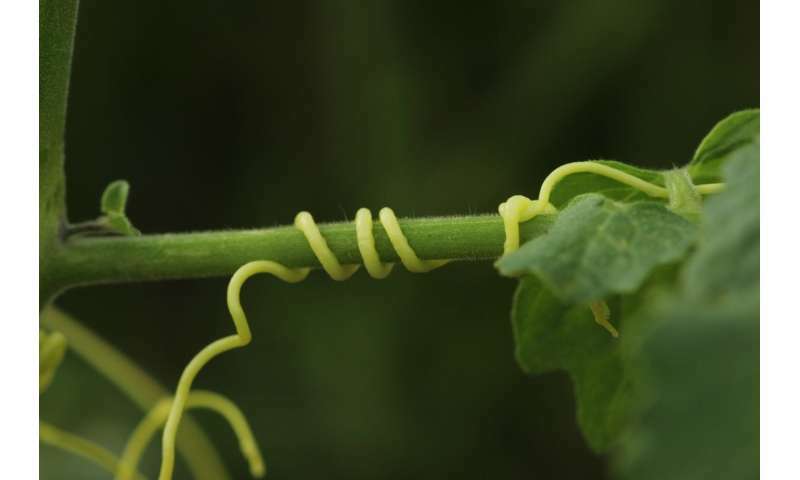 Using genome-wide phylogenetic analysis and synteny information, they found that the ancestor of Cuscuta split from the common ancestor of Cuscuta and Ipomoea 750 million years ago and the common ancestor experienced a genome triplication event. The Cuscuta genome then rapidly evolved and many genes were lost during evolution. The scientists developed a strict and precise bioinformatic pipeline to screen for the lost genes in the C. australis genome. They found that about 11.7% of the well-conserved genes in autotrophic plants do not exist in the C. australis genome, and many of the missing genes are important for photosynthesis, functions of root and leaf, resistance to environmental stresses, and regulation of transcription. Interestingly, several genes critical for flowering time control are also missing, such as FLC, FRI, SVP, AGL17, and CO. The gene loss is correlated with the major body plan changes in the dodder. The scientists also studied possible genes related to the evolution of the haustorium, a parasite-specific organ. They found that about 1/3 of highly expressed genes in the haustorium are also strongly expressed in the roots of autotrophic plants. Evidence from transcriptomic data, positive selection, and gene families with expanded members indicate that a number of genes are possibly involved in haustorium formation, including a pectin esterase, a serine carboxypeptidase, and transporters, as well as novel genes with unknown functions.